Step 1 - Apply James Brown Hair Revive Dry Shampoo to the roots of your hair, leave it for a few seconds, and then proceed to give yourself a crazy head massage. This is going to absorb all of that oil and leave your hair with that just-washed feeling. Step 2 - Spray underlying sections of your hair with the L'Oreal Elnett Satin Hairspray and backcomb for volume and lift at the roots. Now at this point if you're going to go ahead and put together some sort of up-do then go for it. If you're leaving your hair loose then you're going to need Step 3. 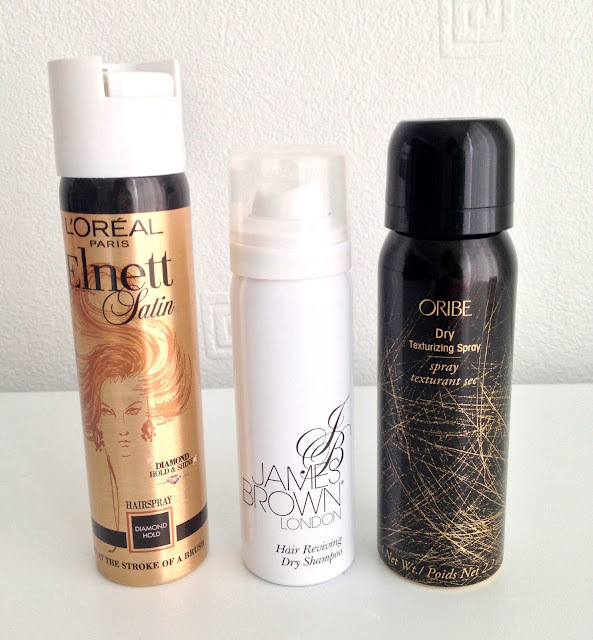 Step 3 - Spray any areas that you want added volume or texture with Oribe's Dry Texturizing Spray. It's going to create more of a tousled texture but still keep your hair soft and moveable. This product also travels with me in my handbag. Now that your hair is looking and feeling great, has plenty of body and bounce everytime you swish it around, and also smells delish from the Oribe spray, it's time for you to STOP LOOKING IN THE MIRROR AND RUN OUT OF YOUR HOUSE - YOU'RE LATE REMEMBER? !